Bracelets: the usual plus two metal and fabric Indigo Rose Design bracelets, and gifted set of black bangles from my parents. Nice relaxing day with my family today for Father's Day, and working at Church Online later in the evening. Jeans and a singlet seemed fitting, and I dressed it up a little with the jacket and the bracelet stack my parents gave me. Unfortunately today's photo makes me look like a ghost as I'm so white, haha! I need to figure out why my camera is so crazy lately, I'm going to Sydney next week so want to be able to take some good photos there. I've worn the singlet before here, jeans here, shoes here and bag here. 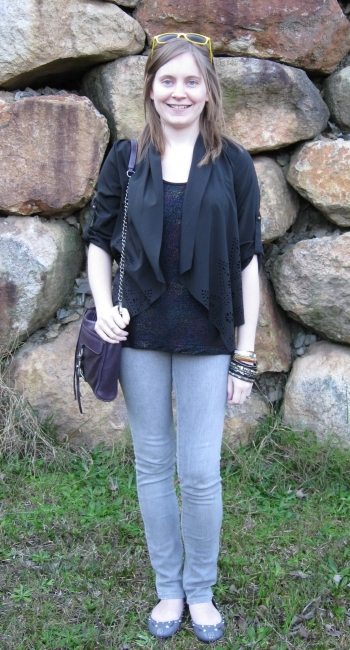 This is the first time I've worn the jacket on the blog. you totally have the best collection of bags! The famous MJ mouse flats! I love that you have a pair. They look fab! this jacket is just so versatile...and love that yellow sunnies, so fun and chic!! Love the softness of the jacket. So pretty! 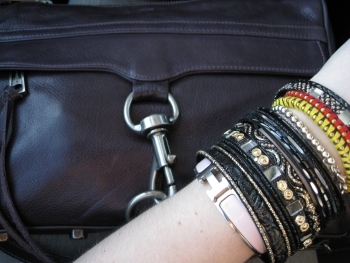 I love how your mix and match the accessories.